Peel the squash and seed it. Cut into 1 inch by 1 inch cubes. 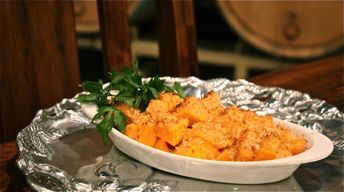 In a bowl, toss the squash with the cream, nutmeg, sage, salt, pepper and 1 cup of Gruyere cheese. Butter or spray an oven proof baking dish. Put the squash mixture in the dish. Cover with foil and bake until squash is tender, about 45 minutes. Remove the foil. Mix bread crumbs with remaining Gruyere and sprinkle over the gratin. Bake until golden brown, about another 15 minutes.